There's nothing more satisfying than receiving free gifts with a purchase and Clinique's Bonus Time* Events are something I get excited about each and every year. Just in time for Valentine's Day (hint hint) Debenhams are currently hosting their Bonus Time Event in stores from February 4th - 21st 2016. 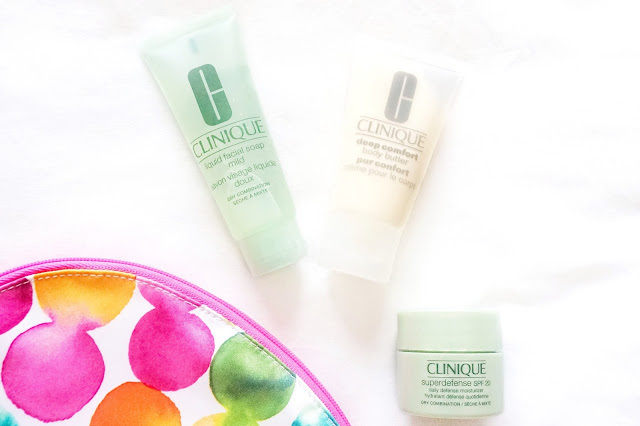 So, if you were thinking about treating yourself or a loved one to some new Clinique goodies or you simply need to stock up on some essentials, Bonus Time is perfect time to do it - it really is the best way to sample some of the brand's most popular products. 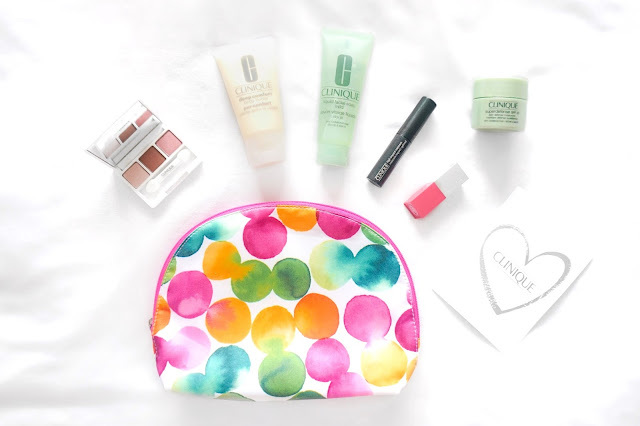 With Spring approaching, the aptly named 'Pops of Colour' event features the most adorable makeup bag containing 6 makeup and skincare miniatures. To qualify for the free Bonus Time gift at Debenhams you need to buy two or more products from the brand (one being skincare or a foundation). 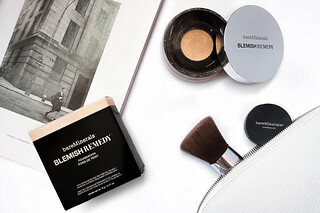 My personal favourites include the Cheek Pop Blushes, the Lip Pop Colour + Primers and Clinique's Take the Day Off Cleansing Balm. 1. Superdefense SPF 20 Daily Defense Moisturiser (15ml) - Fragrance free and gentle on this moisturiser is designed for Clinique's Type 2 customers who have Dry/Comination skin. As I lean more towards the oily side I personally use this at night/if I'm not leaving the house as it can be a little bit too hydrating for me during the day. It's a rich but lightweight cream that it absorbs quickly into the skin and as a bonus it has an added SPF 20. 2. Liquid Facial Soap (Mild) (50ml) - This is Step 1 in Clinique's 3 Step Skincare Routine and as I've only used this once I can't comment on the long term effect of using this. It does leave my face feeling very clean but once again as this is for Type 2 (Dry/Combination) skin I'm not sure if it'll be as effective on my oily skin. It's fragrance free, foams well and it appears to be rather gentle too. 3. Deep Comfort Body Butter (50ml) - Body Butter is something I would never really think of buying from Clinique. I truly didn't know what to expect at first but I've really been enjoying the sample so far. It's unscented which, at first, I wasn't thrilled about but I soon realised that this is the perfect body butter to use whenever I'm wearing perfume as I can hydrate my skin without worrying about different scents clashing. I can imagine the fragrance free body butter will also be perfect for sensitive skin too. I'm very impressed with how silky and soft my skin feels after I've applied this and it seems to lock in the moisture all day. 4. High Impact Mascara in Black - I've had a couple of High Impact samples over the years and even though it's not my favourite mascara ever I do really enjoy using this. There's something about the brush I adore, I can't quite put my finger on what it is but it just appears to be the perfect size for my lashes. It's one of those great all rounder mascaras: it adds volume, a bit of length and most importantly it separates the lashes beautifully. It leaves your lashes looking pretty but natural and you can build it up without it becoming flaky or clumpy too. 5. All About Shadows in Pink Chocolate - Clinique Eye Shadows have always been a bit hit and miss for me. I own 3 of their duos: Victorian Pink (discontinued), Strawberry Fudge and Like Mink and I adore the first two, especially the shimmer shades which boast beautiful pigmentation with no fall out, but the latter wasn't too impressive. The colour included within the bag is Pink Chocolate, a trio which is actually sold as a quad (we're missing the dark brown shade) and it contains the most beautiful pink shimmer shade, a light pink matte shade and a pretty warm toned brown. They're not as fantastic as Urban Decay shadows but I'm happy to report that they perform well and blend really nicely.When worn together the trio create such a pretty, feminine look which would be perfect for Valentine's Day! 6. 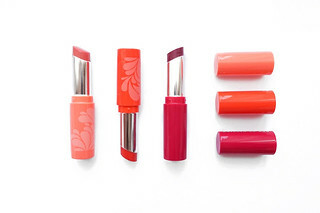 Pop Lip Colour + Primer in Sweet Pop - If you've read my Yearly Favourites post you'll already know that I am a huge fan of the Clinique Pop Lip Colour + Primers. The formula is wonderful and they glide on, smoothing out any ridges and lines on the lips and every shade I've tried so far has amazing pigmentation. Sweet Pop is a pretty light/medium pink with cool undertones and it looks lovely paired with Pink Chocolate shadows! So that's it from Clinique's Bonus Time Gift! * I think you receive a great selection of generously sized products and I'm very happy that the 3 makeup items work so well together. 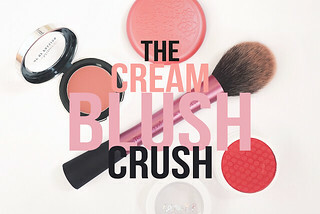 Combined, they create gorgeous soft date night look - perfect for Valentine's Day tomorrow! You still have a week to take part in this offer at Debenhams so if you do pick up a Bonus Time gift I'd love to know what you think and which Clinique products you've picked up to qualify!